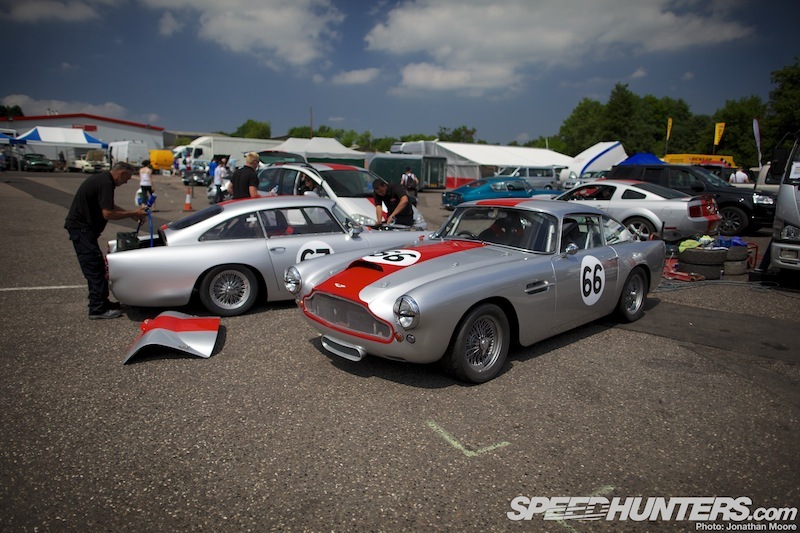 Take all that stuff you may think about Aston Martins being refined, sedate machines and forget it. 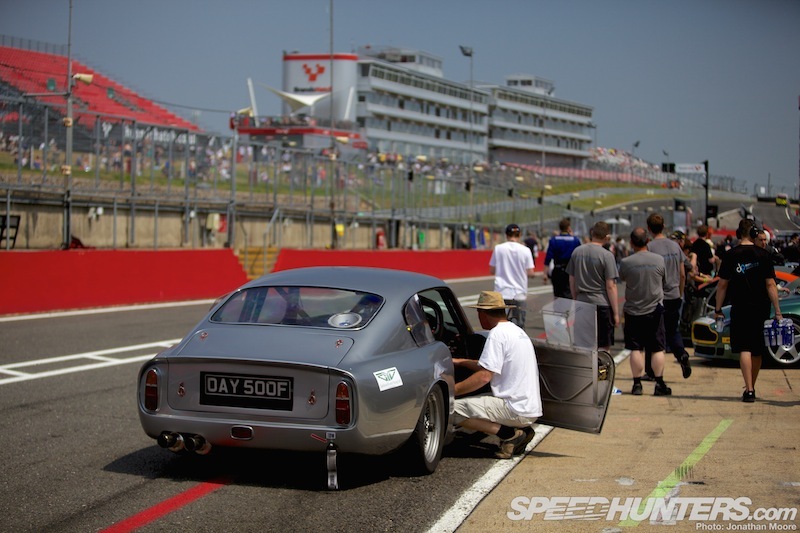 It’s easy to think of an Aston as another gentlemen’s cruiser, either tucked up in an air conditioned vault somewhere or occasionally tootling round the better streets of a capital city, but the Aston Martin Owner’s Club festival at Brands Hatch in the UK showed that where Astons of all ages are truly at home is on a track, especially when they have rivals to play with. 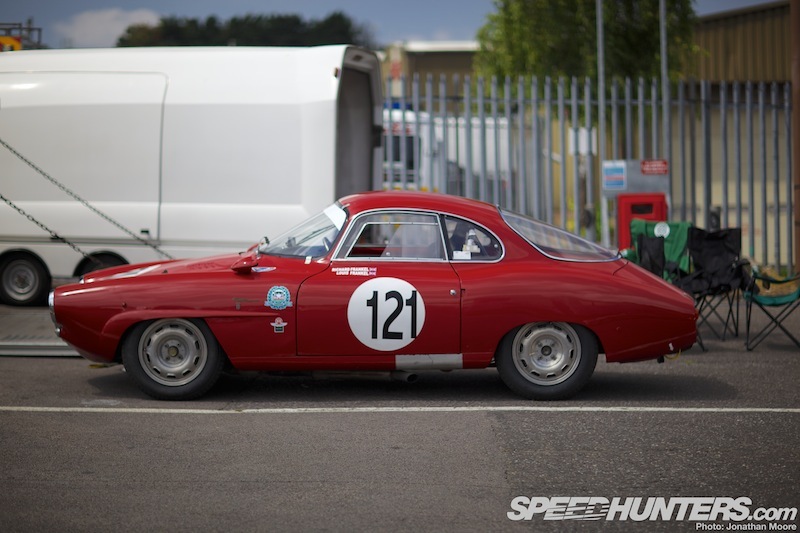 Whether old or new, priceless or merely very expensive, it seems that AM owners are at their happiest when they’re engaging their glorious machinery in pitched battle around a racing circuit. 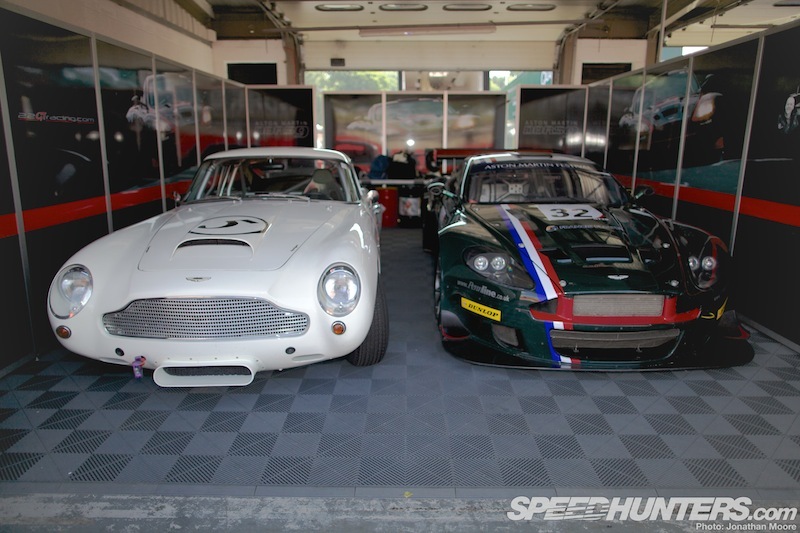 Elegant on the outside they may be, but the AMOC racing series unleashes the beasts that rage within. If I’m being honest, before arriving even I was mostly expecting a relatively sedate experience (blunt-nose ’80s V8s of the Intermarque grid aside – more on that later). But the reality was something else. 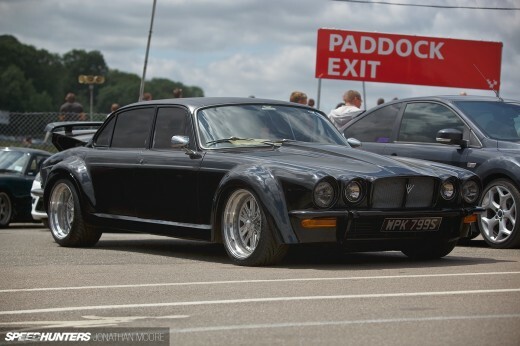 Two days of some of the most eclectic, exciting cars I’ve seen in years. 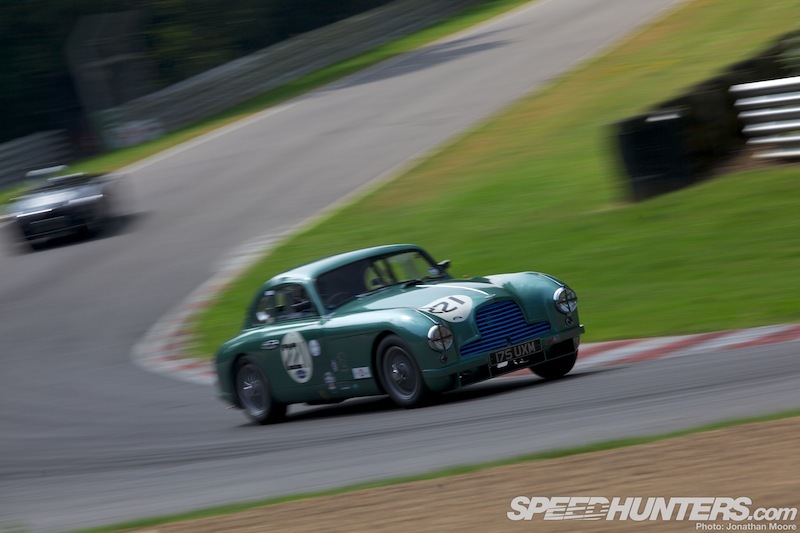 I spent a glorious weekend being burned to a crisp at an unfeasibly sunny Brands Hatch for a special edition of the regular AMOC series, which included special celebrations for the centenary of Aston Martin. The regular AMOC races were supplemented not only by a special Centenary GT race with some very familiar modern cars, but also with an enormous parade of Astons from across the last century, demonstrations of classic AMR racing cars and an appearance by Aston Martin’s star World Endurance Championship GT signing, Bruno Senna (more on that in the next story). 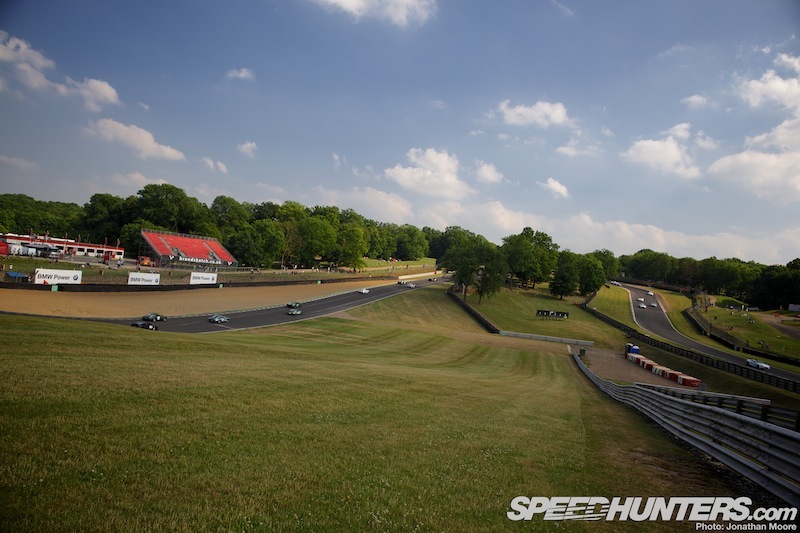 Brands Hatch is one of the UK’s best circuits for spectating, with the majority of the Indy layout visible from several positions. 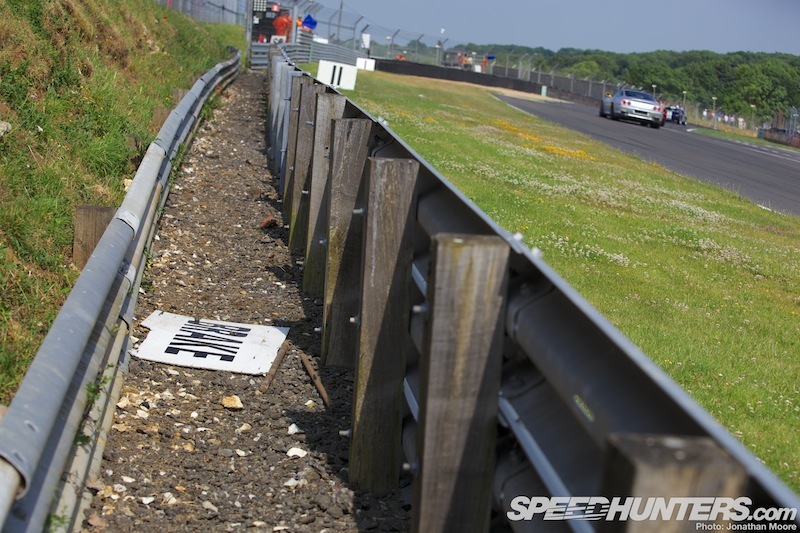 Interestingly for both competitors and the crowd who thronged the fences, the shorter Indy track would be used on the Saturday, before racing switched on Sunday to the classic long Grand Prix extension that snakes out into the Kent countryside beyond. 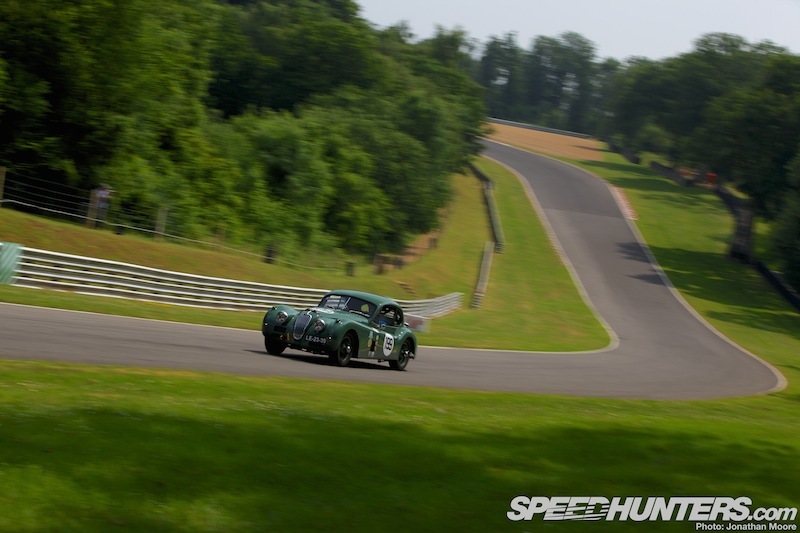 AMOC racing weekends aren’t just about Aston Martins though. 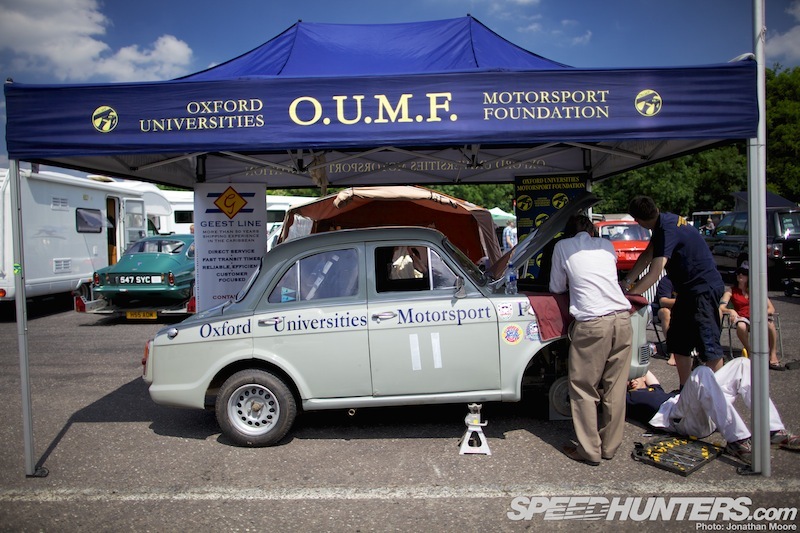 The club was founded just after the Second World War, and has been organising meetings ever since. 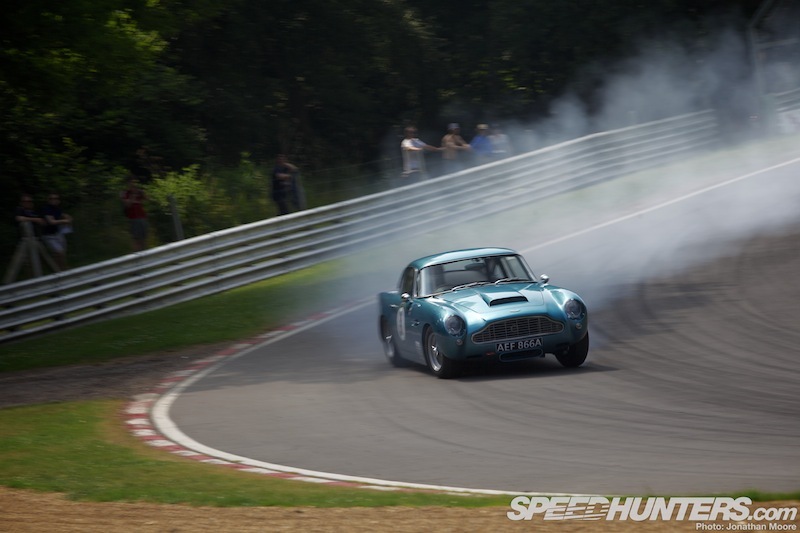 Astons might be at the core of most grids, but they were anything but exclusive. 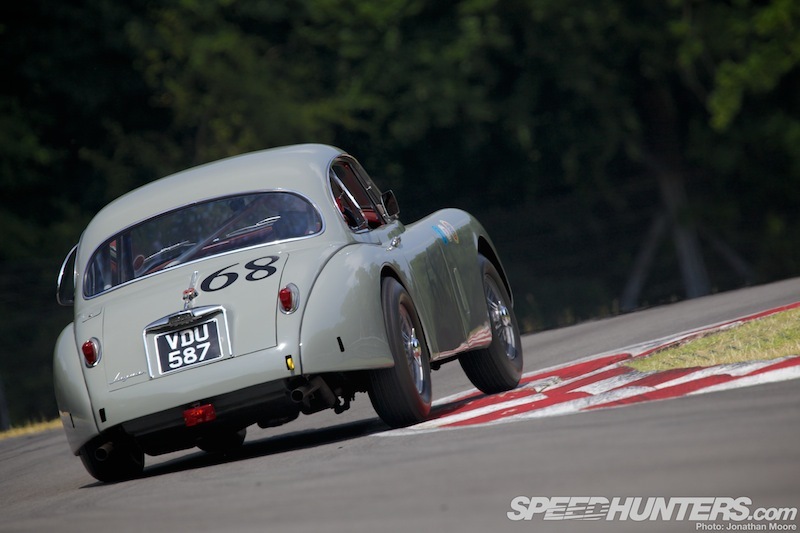 A regular AMOC event currently combines half a dozen different championships, starting with 1930s vintage racers (driven almost like karts out on track, with drivers bouncing up and down to get traction!) 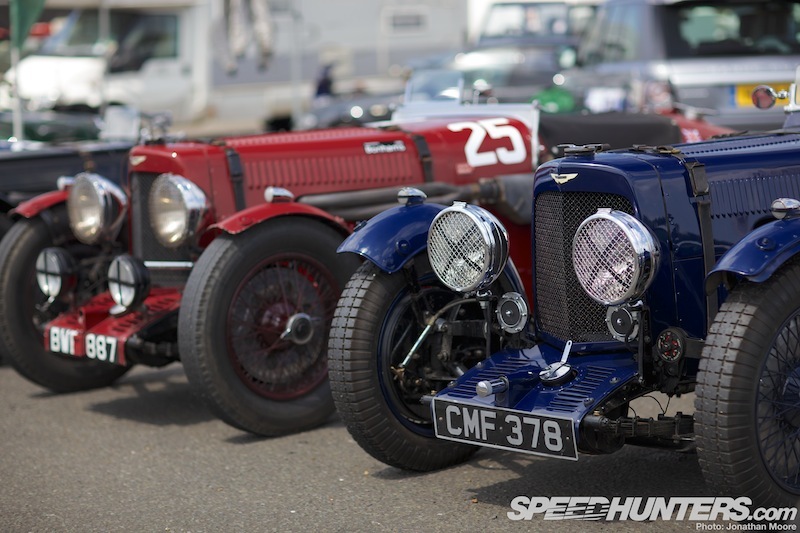 that include Bentleys, Talbots and Frazer Nash racers next to AM Speeds, Le Mans and Ulsters. 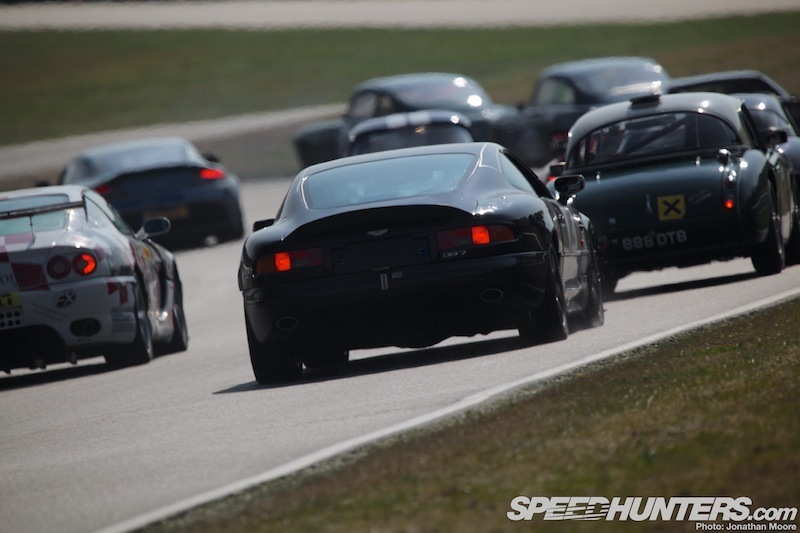 … and a whole lot of AM DB2s and DB4s. 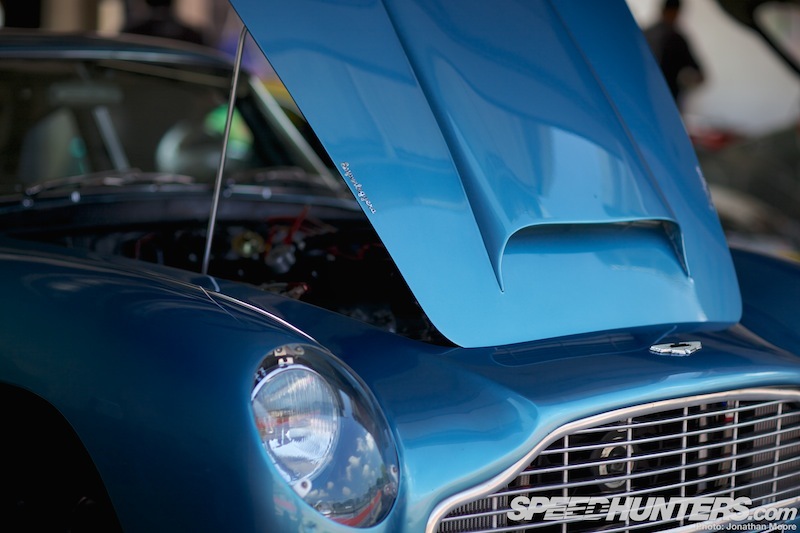 Having been overwhelmed by the exposure given to the DB5 since an early age, I’ve really warmed to the curvaceous grand tourer looks of the DB2 in recent years. It’s funny how you can sometimes become blind to a car: the older sister that gets hidden behind the glory of its younger sibling. But the blinkers are now off. 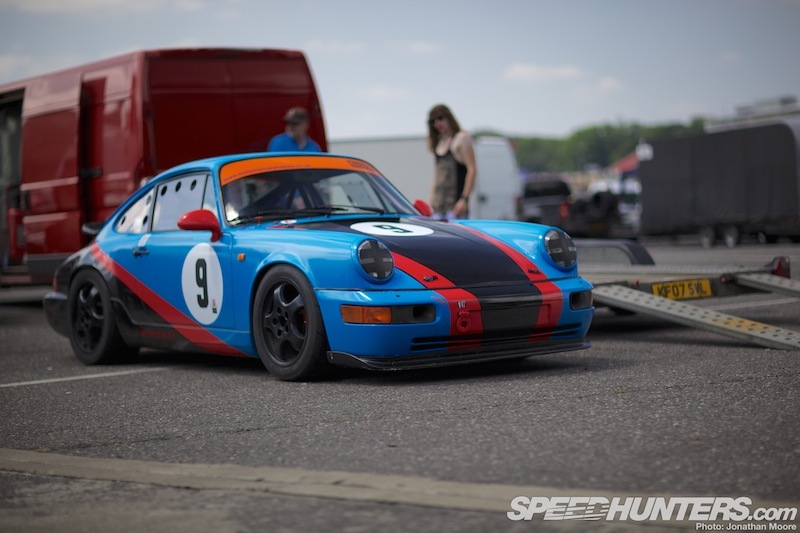 One of the many things I love about these kind of cars is that most are fully taxed and road legal: you can literally drive them to a race, hammer out the laps and then drive home again! 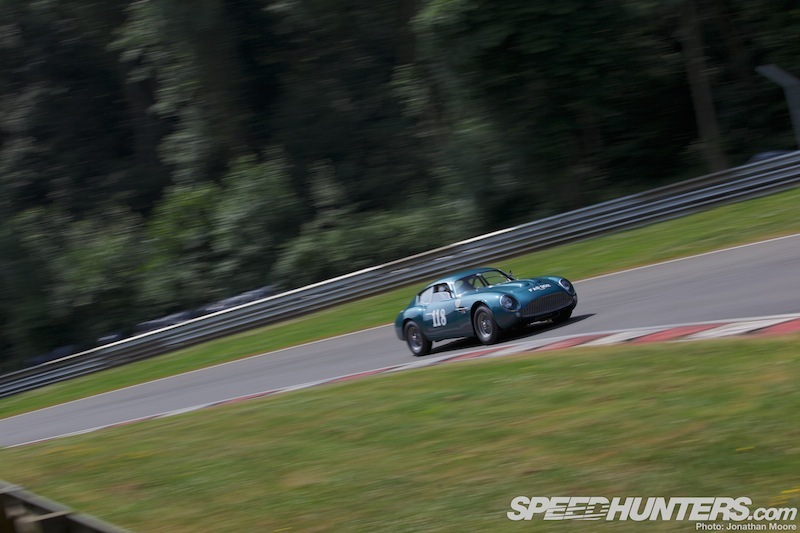 … and also this patriotically painted Maserati 300S, whose colour completely confused me from a distance. But then the side pipes and trident logo were giveaways! 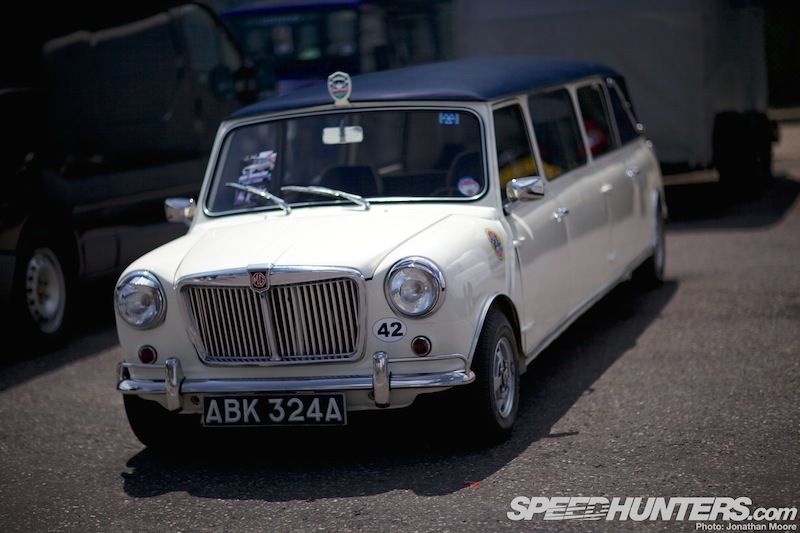 These are not cars that you’d necessarily look at with lust and wonder (though check out the arches of this Austin A35 Sprint!). 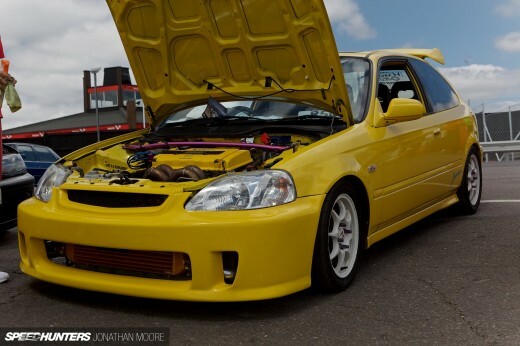 However, they represent the birth of touring car racing, and their lack of technical finesse just makes them that much more exciting when they go wheel to wheel. 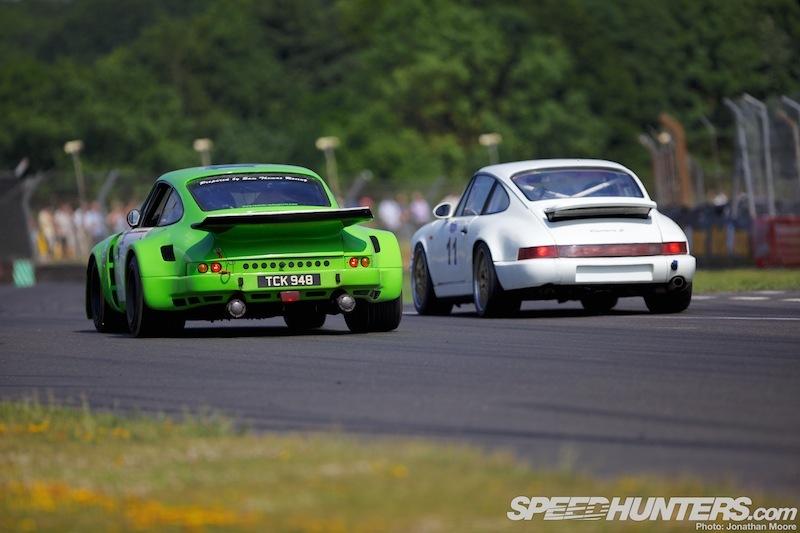 Whilst they might not ooze power, the positives are their light weight and lack of grip. 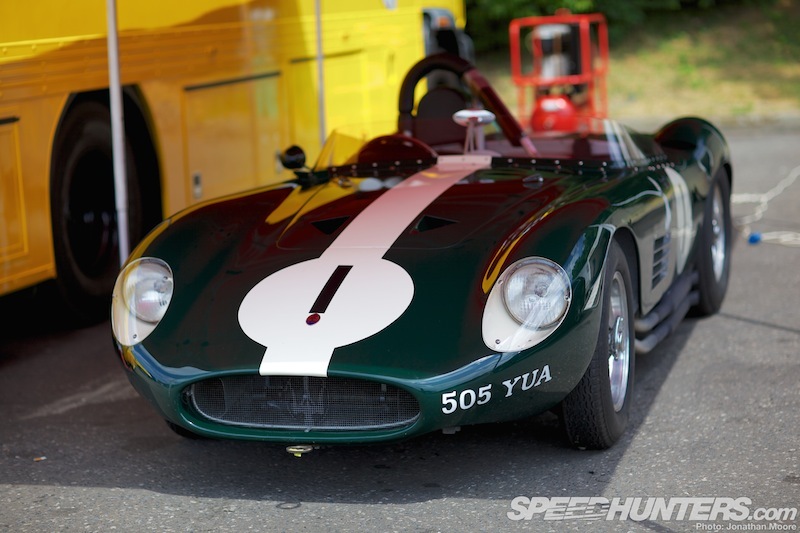 Yep, you just need to see them on track. They basically never point in the right direction and usually have at least one wheel off the ground. 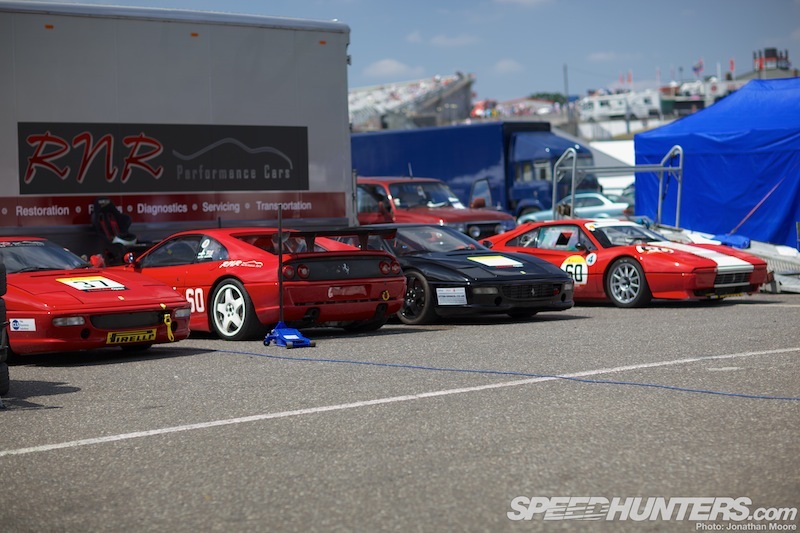 Throw in some Jags and Abarths into a 30 minute race, and you get a grand display. 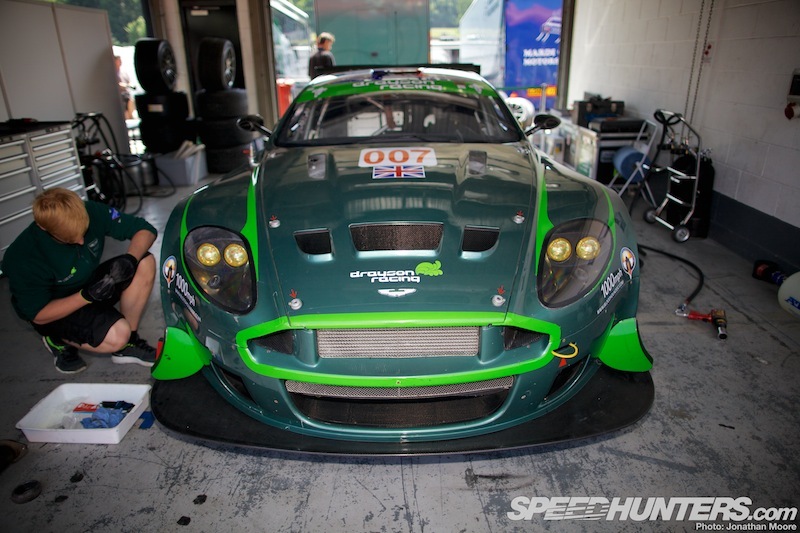 It’s also good to see how these kind of cars present great opportunities for new recruits to the racing scene. Old bringing on the young, with spanners more in use than computers. 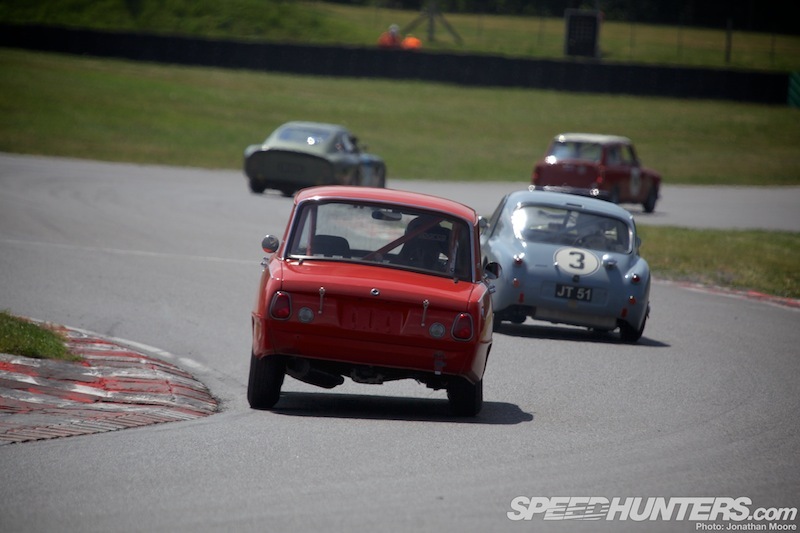 Moving into the ’60s, one of my favourite races over the weekend was the HRDC All-Stars. 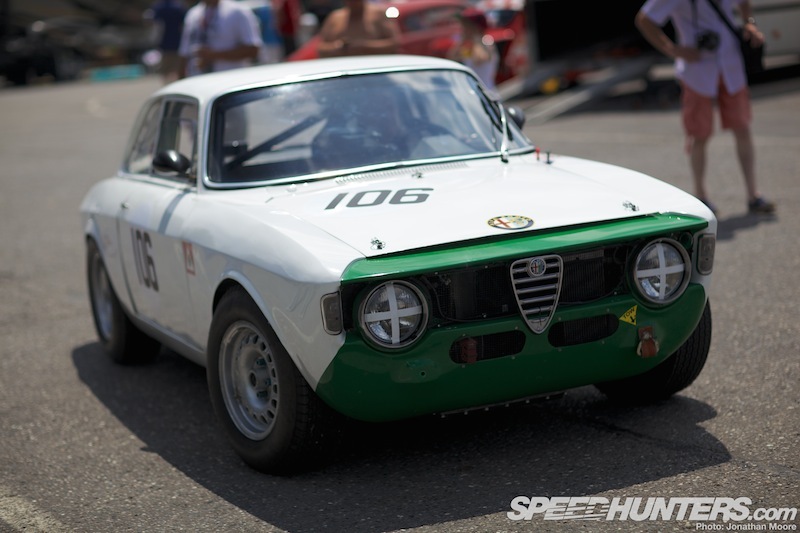 I never get bored of seeing Cortinas, BMWs and Alfas in ’60s touring car mash-ups, but this series was far more wide-ranging – as so much of the AMOC content is. 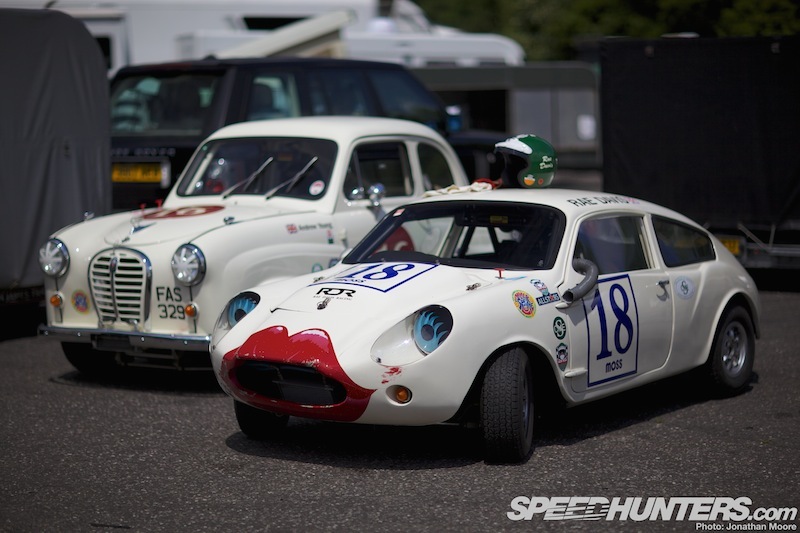 GTs were thrown into the mix, both big and small: a couple of grunty TVR Griffiths at one end of the scale, and this cute Mini Jem GT at the other – another Mini variant along the lines of the Mini Marcos I featured at Montlhery last month. And that’s the point. It frequently happens that you expect one thing but get something completely different. I get a bit bored of one-make series droning around, with no aural variant, but these kind of meetings are just a delight for the ears. 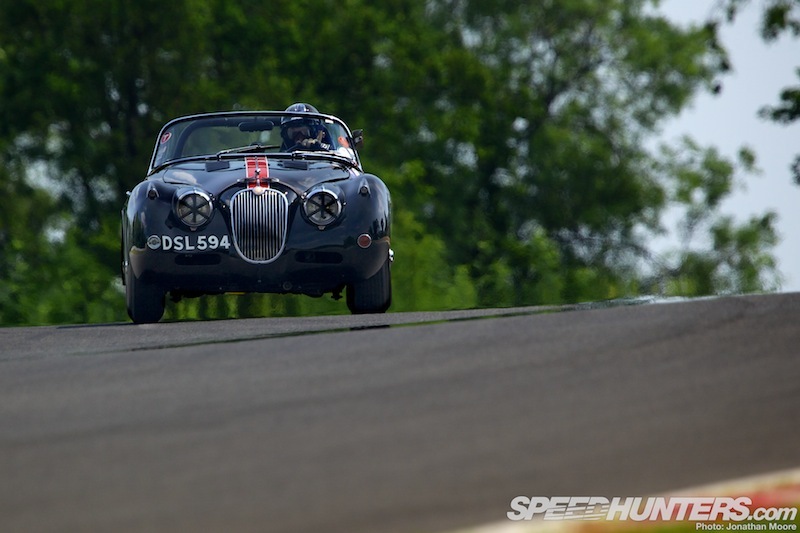 You’d think that vintage British sports cars would sound a particular way, with straight sixes or little four-cylinders barking away, but the ’60s GTs were often beasts and even the little ’50s tourers sounded more furious than their modern equivalents. 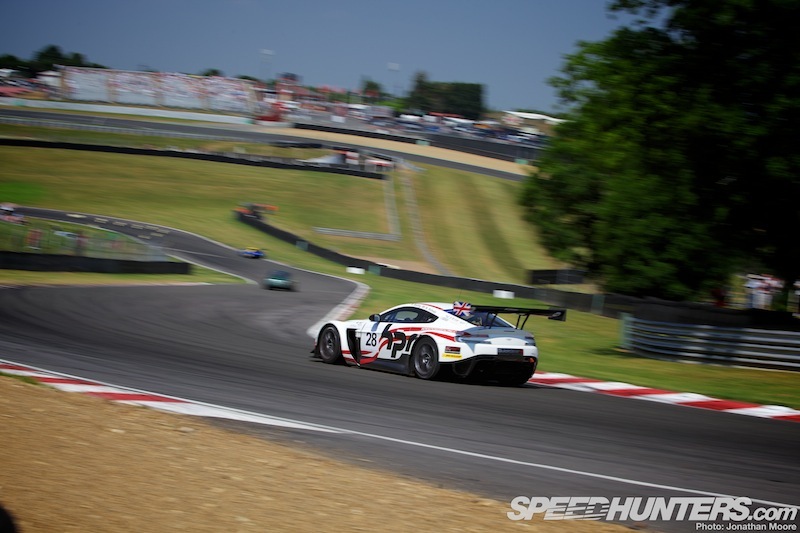 Okay, except maybe the modern GT3 Vantages, which sound like Second World War fighter planes. I have a similar reaction to when I witness modern AMGs: it’s their guttural howl. 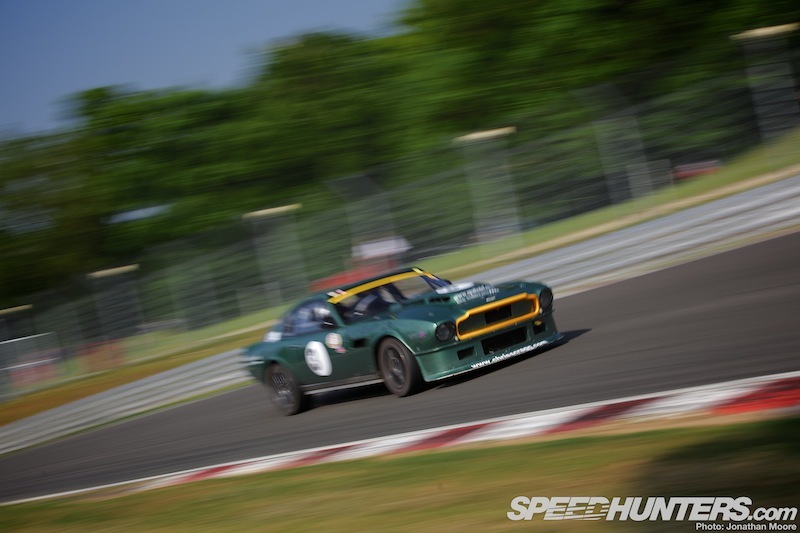 The majority of Astons of any given vintage that were racing at Brands sounded like they had a Tyrannosaurus Rex on the inside trying to rip their way out. It just doesn’t go together at first, but it’s a quick thing to get over. 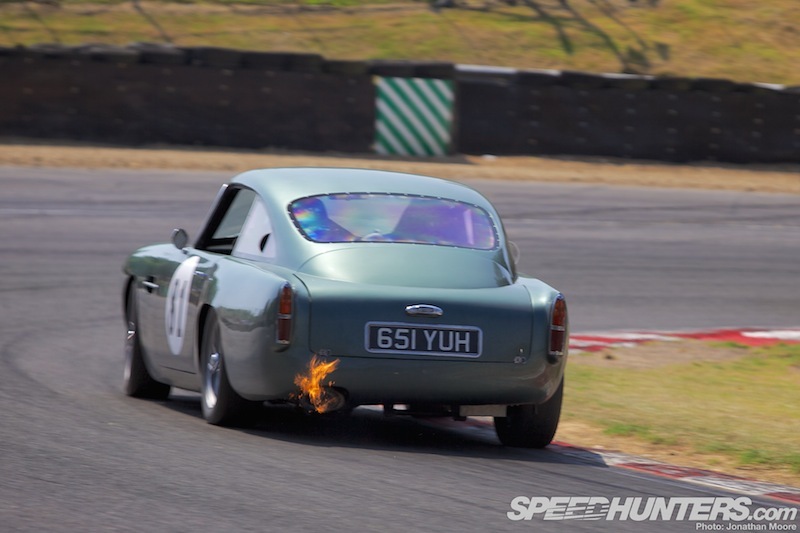 … or spitting flame. Surely they shouldn’t be doing this kind of thing?! Ah, but I’m so glad they do. You can sense the visceral pleasure that the drivers are getting; the smiles inside the helmets must be as wide as the grilles up front. Think blunt force trauma. Think hammer wrapped in velvet. Think hilarious, unbridled entertainment. 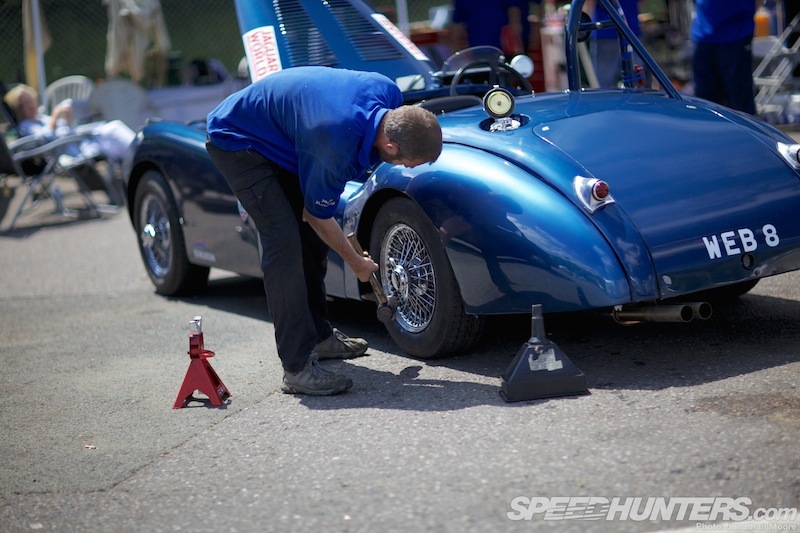 Back to a final check-in for a regular part of an AMOC weekend: the Intermarque Championship. 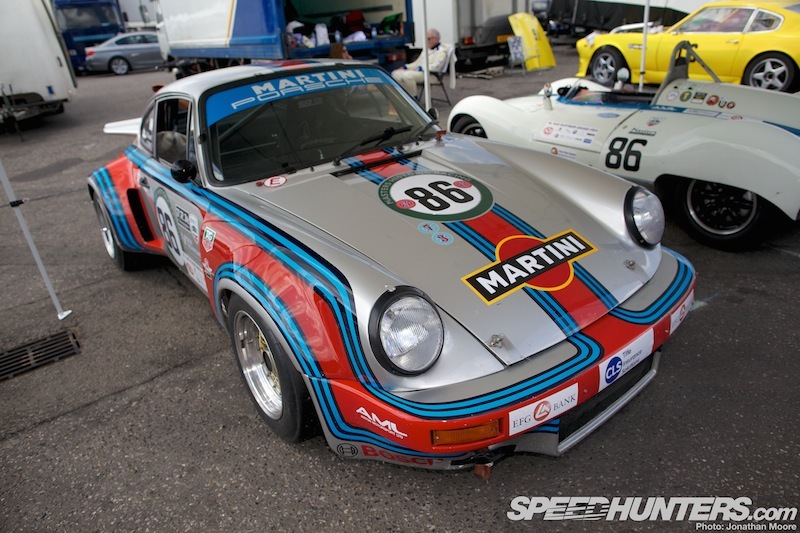 This series goes back to 1973, and it’s carried the same ethos through the decades: high performance, over-the-top GTs slugging it out on track. 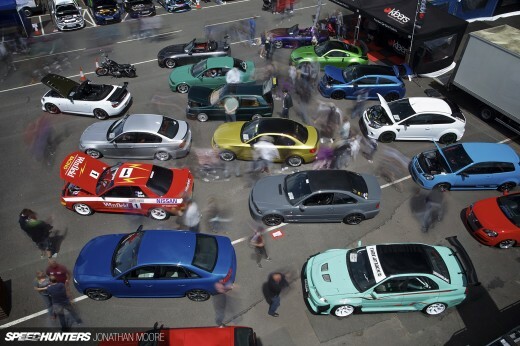 There was so much awesome it was almost difficult to take in. 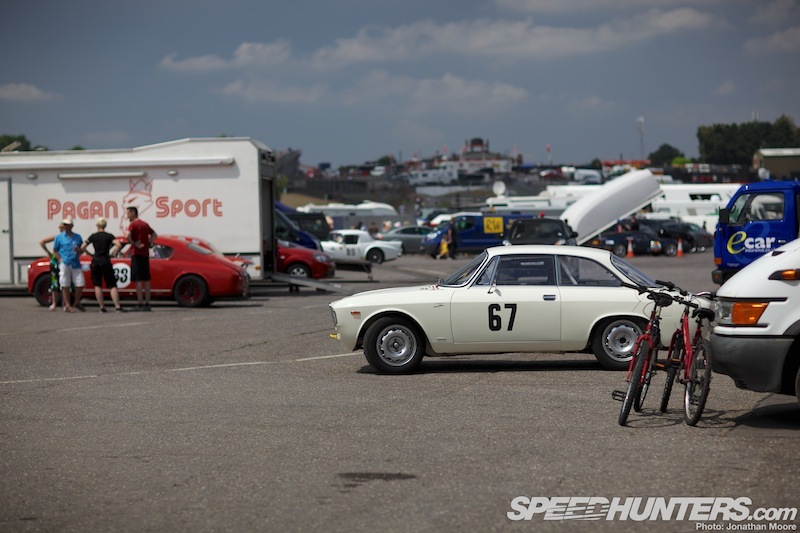 … and even a 328 GTB, a 550 and a 456 GT. Intermarque is not just about driver against driver, but also brand against brand: each manufacturer has a ‘captain’, who helps coordinate their team of cars during the year. 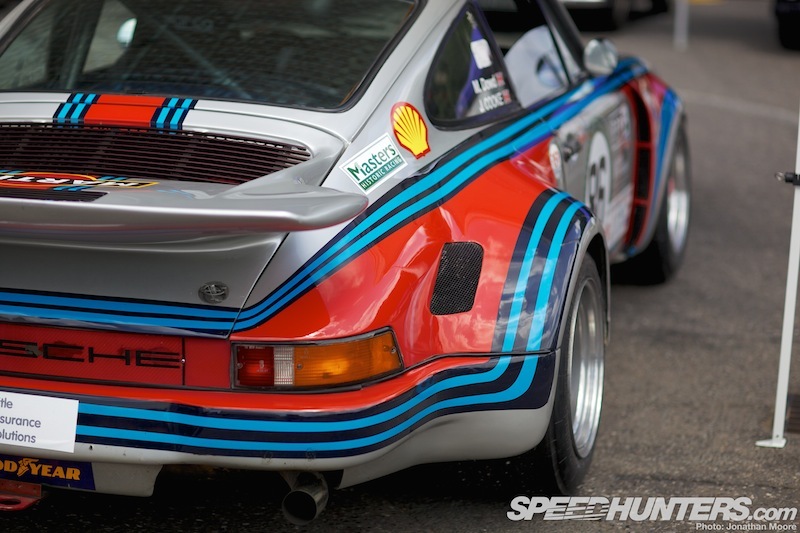 Aston Martin were represented by DB4s, DB7, V8s and GT4s, and it was a similar story with Porsche, with 928s, 964s, 911s of various vintage and this glorious ’74 RSR. 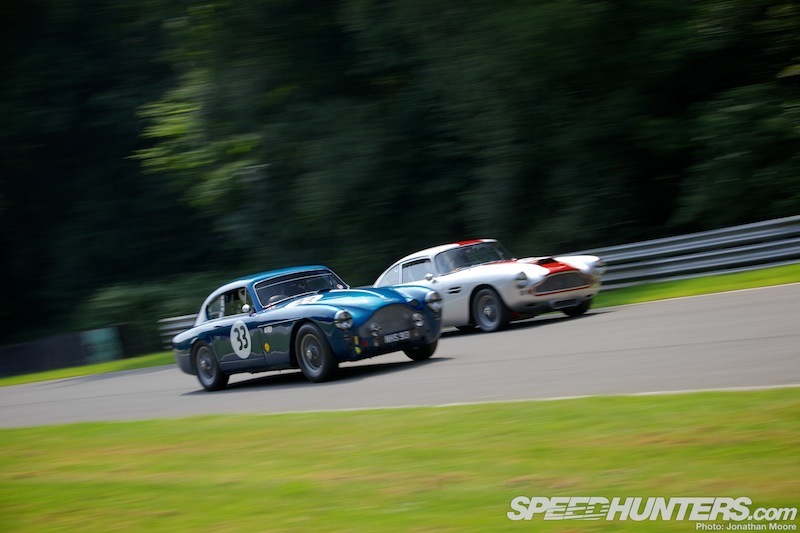 Almost 50 cars took part (in fact, I think every race was at capacity), with the oldest car over 50 years old (a Healey 3000) and the newest an N24 Vantage from 2009. 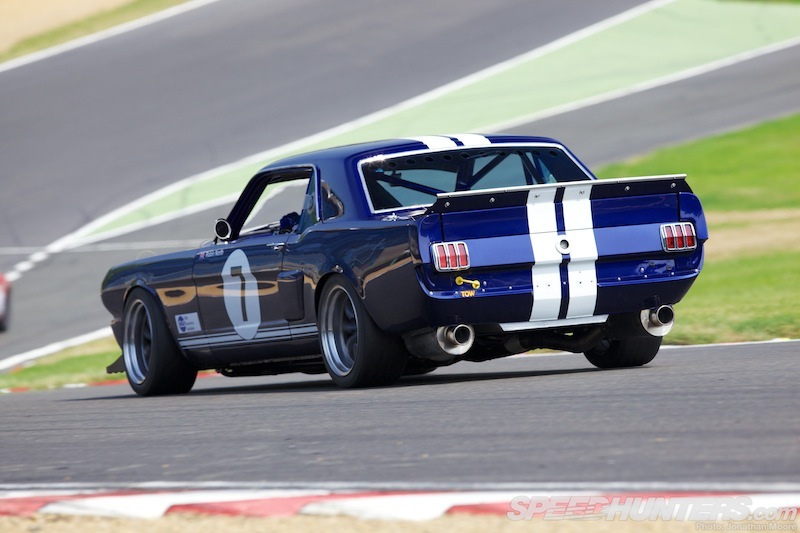 For instance, in qualifying for Sunday’s race this amped-up ’65 Mustang headed a ’76 Aston V8, five late ’50s DB4s and a brutal ’65 Sunbeam Tiger before the first 355 even got a look in. 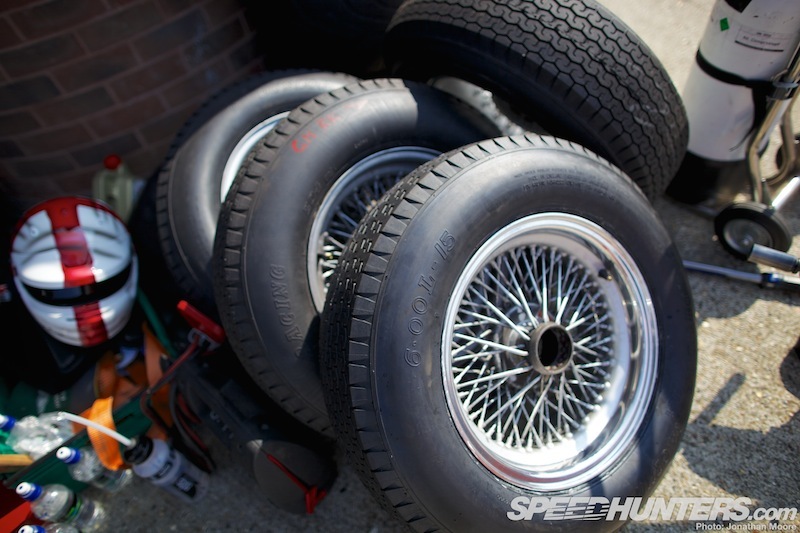 … which was quite a contrast to the virtually indestructible hard compound treaded tyres used on the old DBs! And then there’s the tool you need to fit the wheels… No hydraulic line required, just a strong arm. 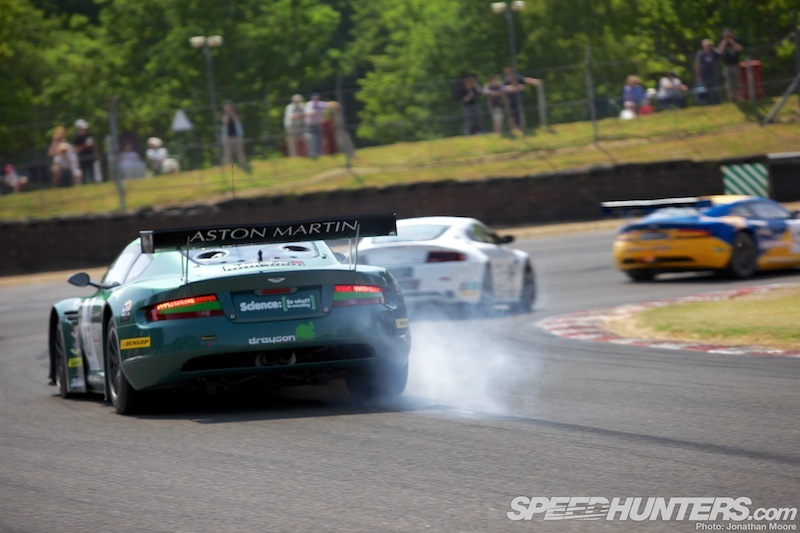 … and Drayson Racing’s Vantage that raced in the American Le Mans Series in 2010 was also brought out to play. 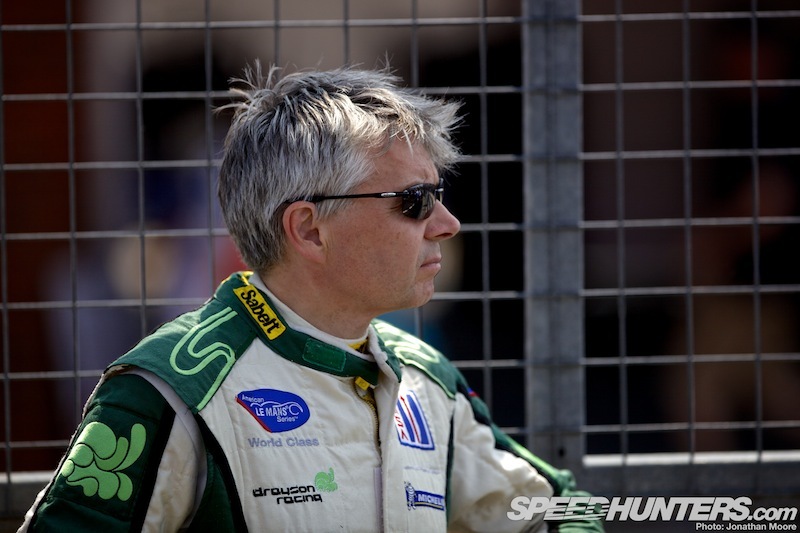 Paul Drayson himself was fresh from setting a new Land Speed Record for electric vehicles in his heavily modified Lola LMP1 – he’s pushed the bar well past 200mph – and would be jumping between the Vantage GT3 and a 1960 DB4GT over the weekend. 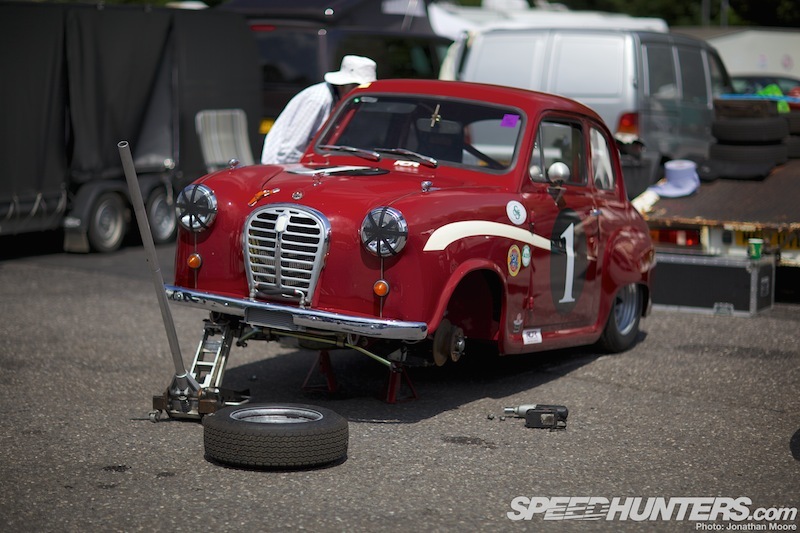 That must have been quite a challenge for muscle memory when it came to braking! 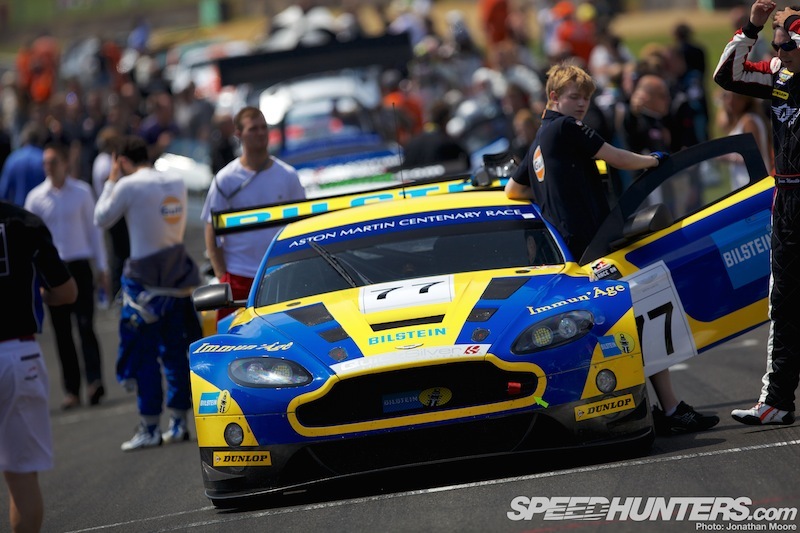 Aston Martin Racing ran the Bilstein-liveried Vantage which had been so fast at this year’s Nürburgring 24 Hours and won the Blancpain round at Silverstone. 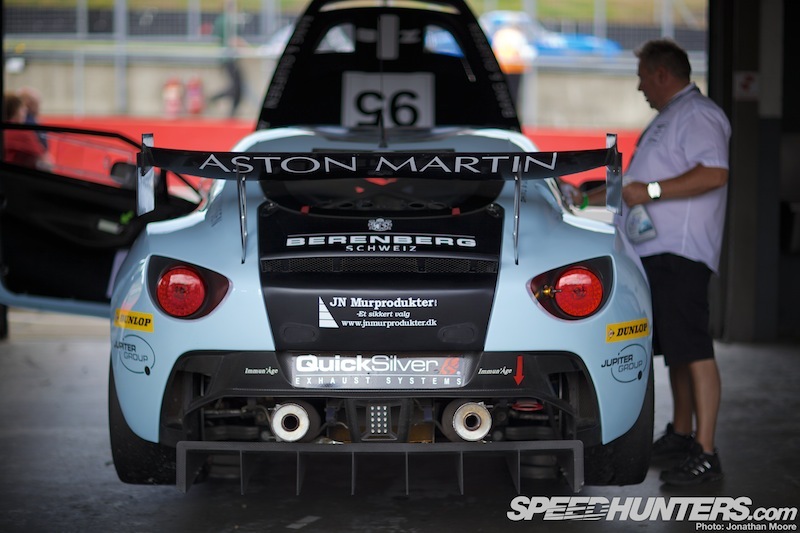 As with most of the GTs, they carried a tribute to fallen racer Allan Simonsen. 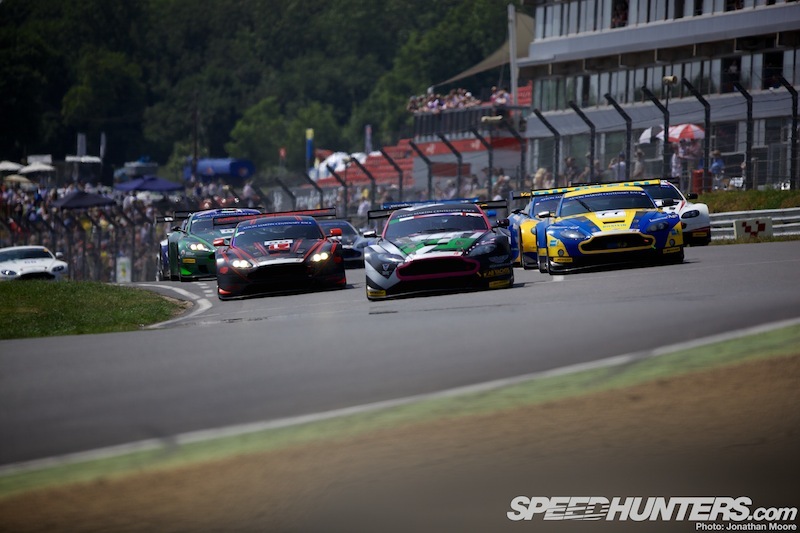 A minute’s silence was held on the grid prior to the GT Centenary Race, which was followed by a huge round of applause to celebrate the popular driver. 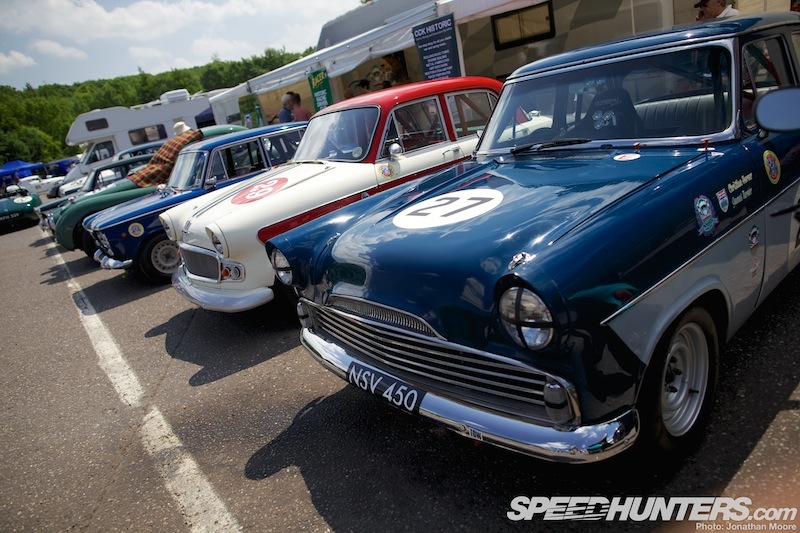 The special GT Centenary Race was the centrepiece for the weekend and featured more cars than most regular modern GT series, but with the added spice of old V8s and DBs running in an invitational class. Was this a demonstration event? 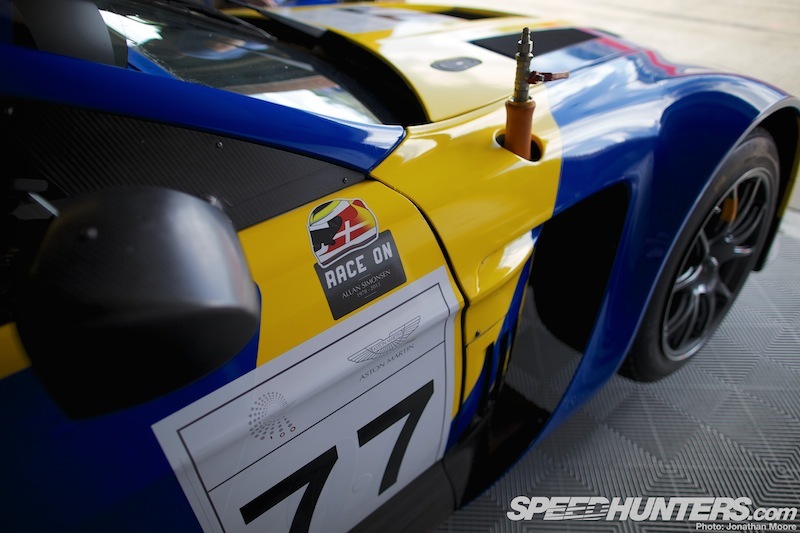 From the efforts of those taking part in the 100 minute, two-driver race, quite obviously not. 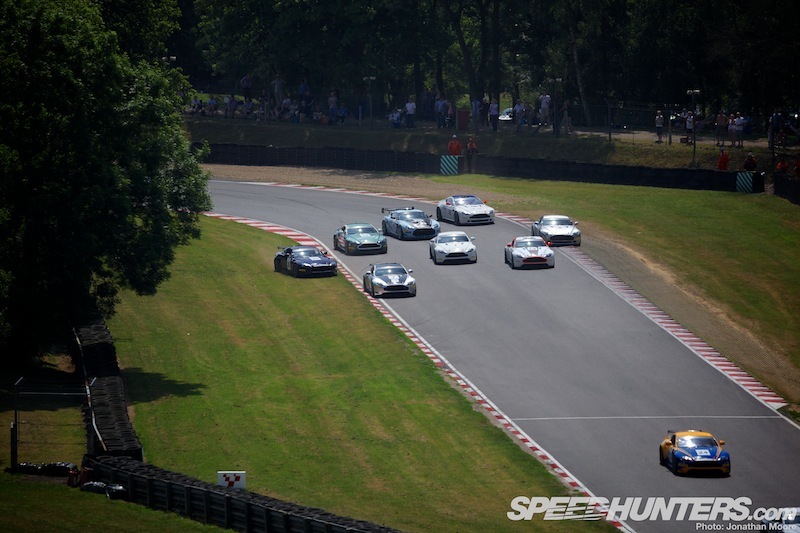 The bulk of the field was made up of GT4 Vantages, but the winner was always going to come from the GT3 ranks, and the nine taking part were soon scything through the traffic. 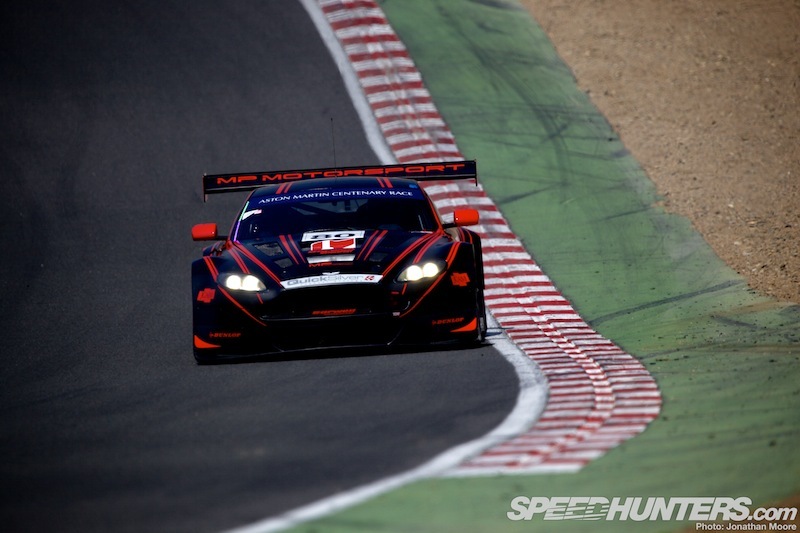 With the Grand Prix track to stretch their legs, the GT3s really did seal the celebration of a century of Power, Beauty and Soul. 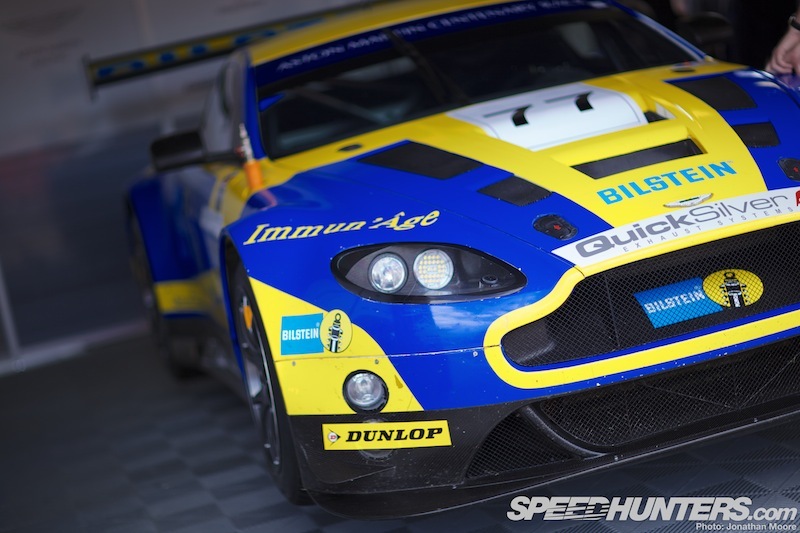 So, next up I’ll turn to the major Aston Martin parades, and the amazing display of cars that took to the track – and the return of Bruno Senna to a track that he cut his teeth on in Formula 3. 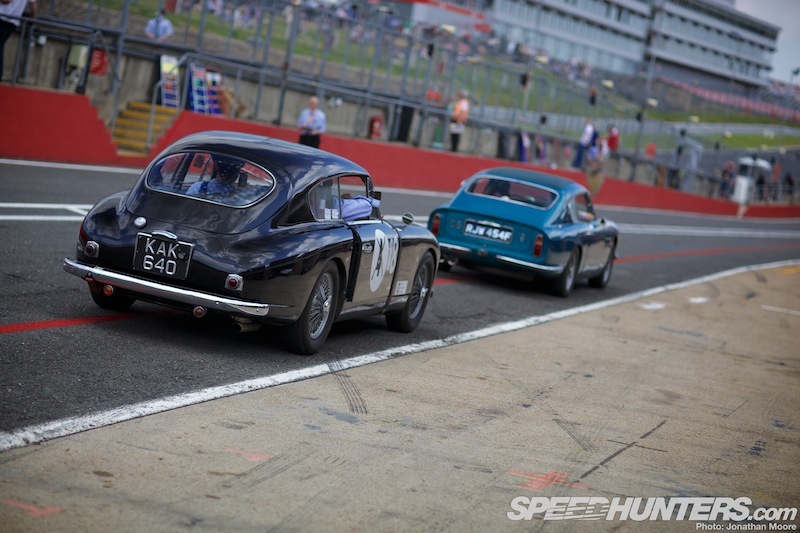 But I’ll leave you with an example that even the track-side luxury wasn’t confined just to Aston Martins!